If you like Transformer Animated and was hoping for more animated alike Transformers showing up, well, you will be in the same loop as i do. 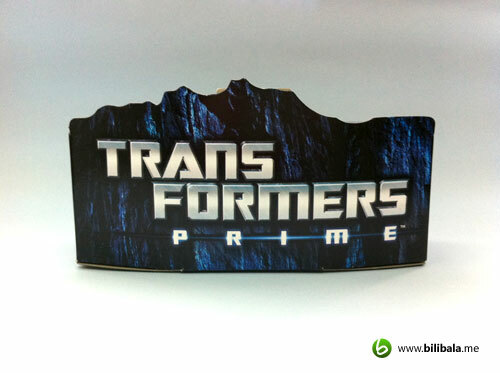 The Transformers toyline that you need to be in a lookout has arrived. 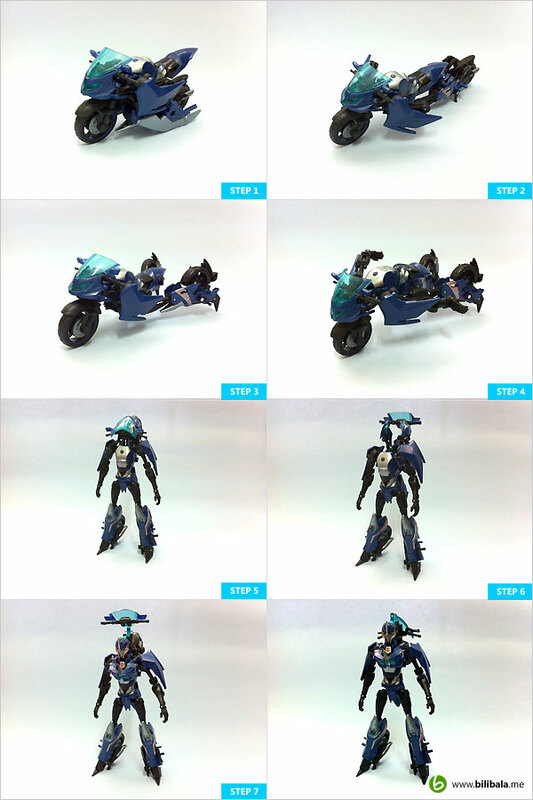 This is none other than Transformers Prime series toyline. For those newcomer, Transformers Prime is a new 3D animated series which boasts fusion of 3D animation and cartoonist alike Transformers character into creating a vast modern and cool robots mode .To me, it is much more an enhanced robot form from it predecessor the Transformers Animated but yet having their own cool and unique characteristics as well. Anyhow, Wave 1 has just hit the store and i have managed to grab all the characters for this round of release. 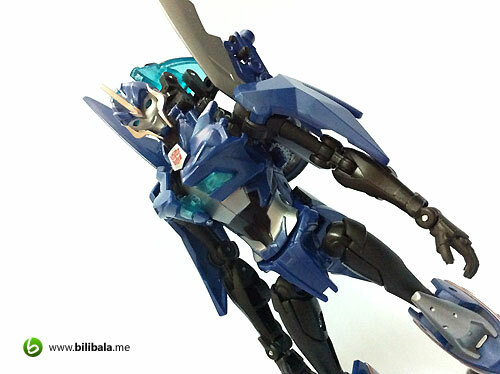 Well, being having a “ladies” first thought, i started off reviewing the only female character in the Prime series: Arcee, in her new bluish and techy outfit. Read on! Here’s how the display stand looks like. Too bad, it doesn’t come with the character name imprinted on the stand itself. 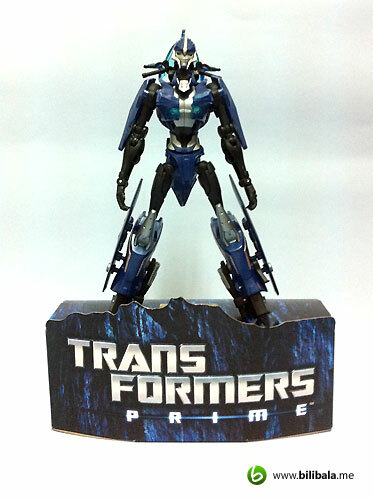 This pretty much is a generic stand which you will get across all deluxe class of Transformers Prime toys. 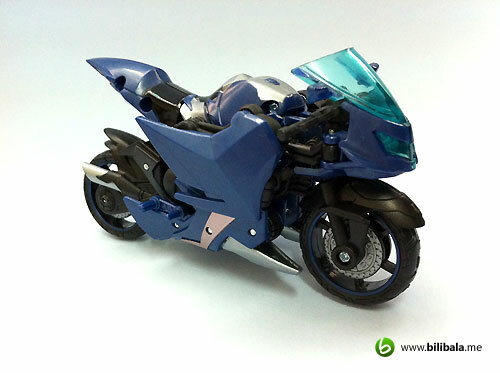 Though is paper based, it is solid made and able to support your figure nicely. 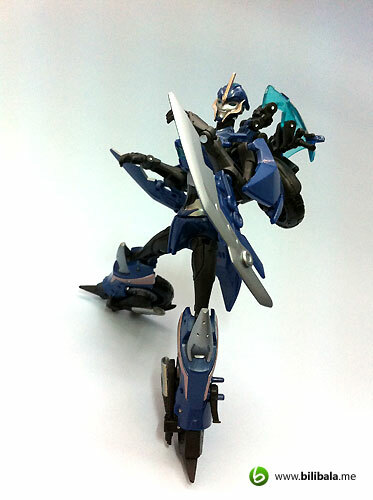 Well, much like the Transformer movie version, don’t expect to see Arcee in some sort of cybertronian sport cars again. 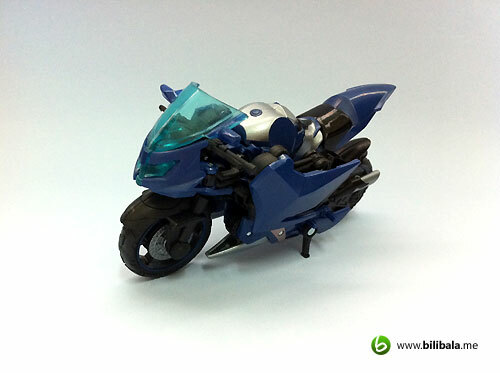 Instead, it resides in a motorbike frame with cool bluish finishing throughout the body shell (so long for the G1 pink version either). And of course with additional black and silver color to make up the overall color composition. I must compliment Hasbro for their good work this round as all the paintwork being done here is of exceptional top notch. You wont expect to see very much lesser paint chips or “out of place” painting for those colored part. Moreover, much of the silver color being used here is of metallic color which add to the finest details of the bike itself (such as body part, tyre rim and muffler) . Kudos to Hasbro in putting up a great piece of toy with great paintwork. 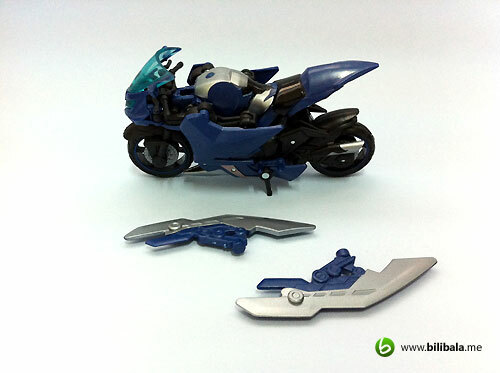 The entire figure is quite light on hand but yet the quality of the plastic is none of compromising. 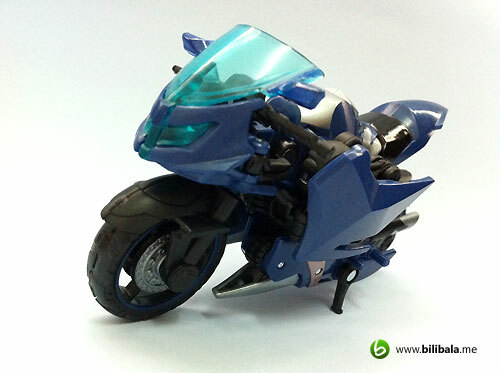 I really fancy the use of transparent cyan blue plastic as the main windscreen and headlights of the alternate mode which definitely suits the overall theme of blue color. 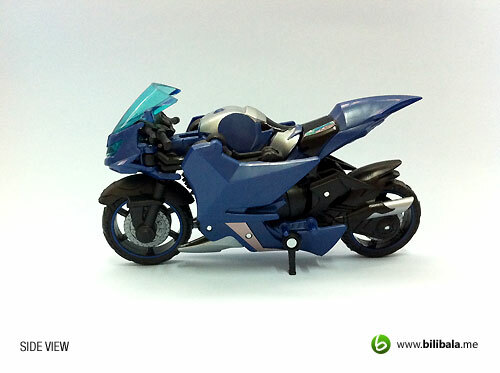 There’s a kick stand of the bike which allows you to station the vehicle with ease. From here, you will able to see the metallic silver/copper over several parts which add to the overall details of the alt mode, especially the silver metallic painting on the tyre rim. The tyre is made of hard plastic. Nothing much you can see from the rear except the 2 metallic silver painted mufflers. 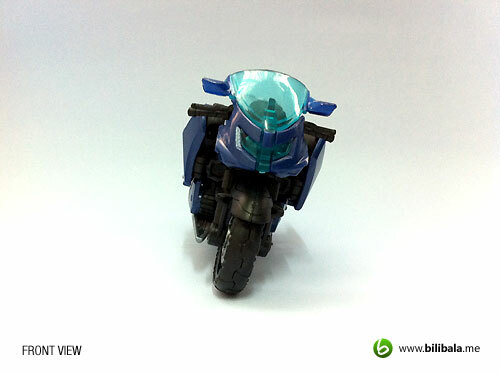 You will be able to see some details on the dashboard of the bike as well. Too bad, they didn’t really paint those speed/mileage meter on them. 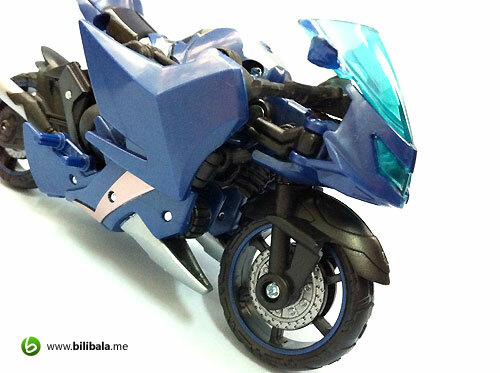 The handle of the bike itself is of soft rubber. 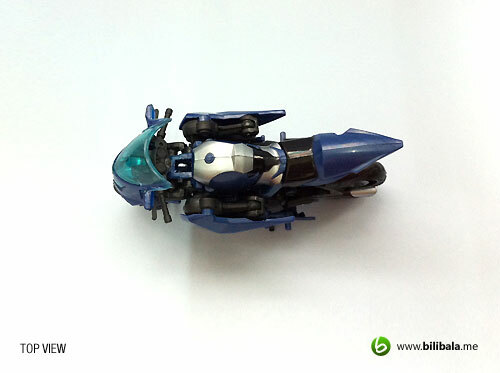 Though it may look small in alt mode, but when it comes to robot mode, it is a different story. 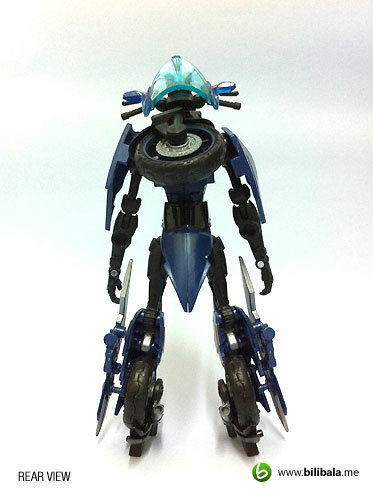 Standing as high as 15.5 cm tall as a deluxe, it does live the name of being one. You will get to see more metallic paintings here in robot mode. 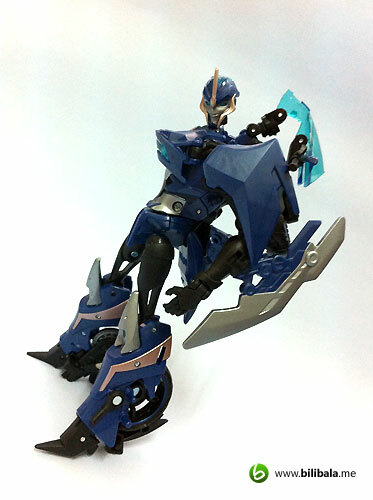 The overall articulation of this robot is very nicely done and with additional articulations you can notice on the neck and waist, it make pose-ability a little more fun. 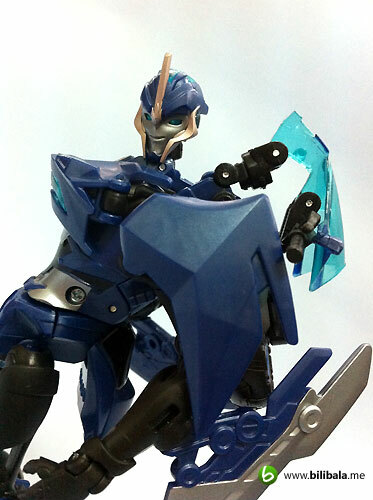 I particular like the neck articulation which makes use of a ball joint that allow up/down swivel movement to it. 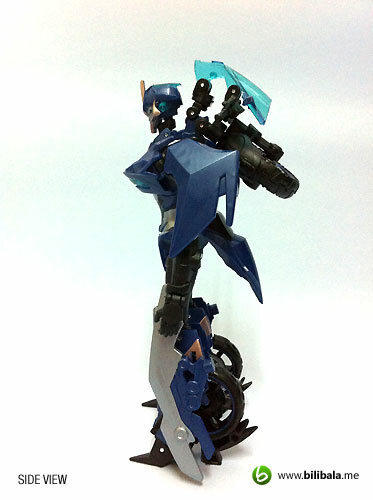 The body to weight proportion is nicely done for the figure as well. You wont be seeing heavy “back pack” design here and posing her confidently is definitely lesser effort. Morever, the overall feature is almost near perfect movie accurate which exhibits the really nice work from Hasbro designer here! 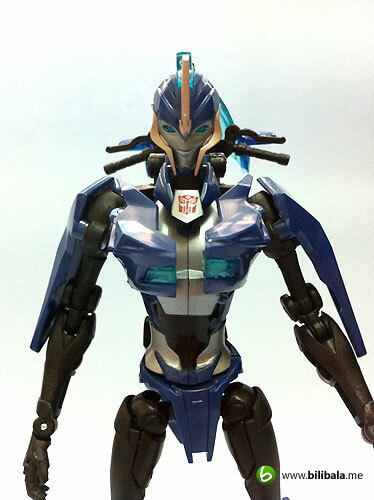 You will see metallic copper color here as well (some from the head part and some from the leg section) which add up to a non boring color scheme of Arcee. 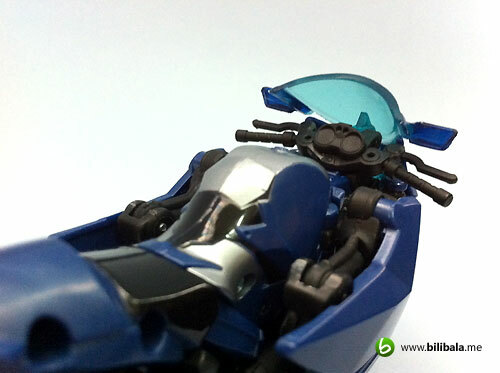 And the cool cyan transparent windscreen from the alt mode, now have transformed into the parts which form the chest plate for the Arcee. Moreover, you will see details of 5 fingers on each hand but there are no individual articulations to them. 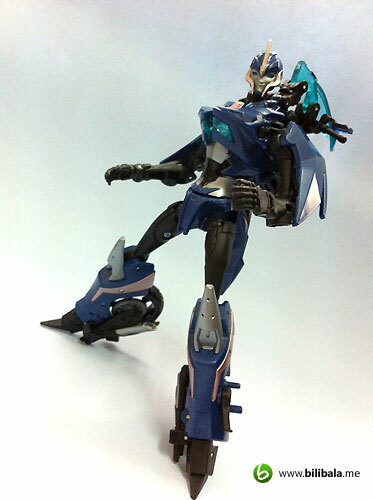 Hmm… the leg design of Arcee does remind me she is wearing some pointy high heel shoe. Kinda “feminine” design if you ask me. Only one of the tyre is being split and transformed into the leg section while the remaining is the backpack for the robot. If you look up closely to the eye section of Arcee, you will see uneven cuttings on them which reflects the design of her iris or more lifelike eye structure. You wont just see a flat eye piece there and this minor detail does bring life to this female robot which i really fancy with. Moreover, the design of the head piece does follow as close as the animated series that has with copper and silver metallic color. 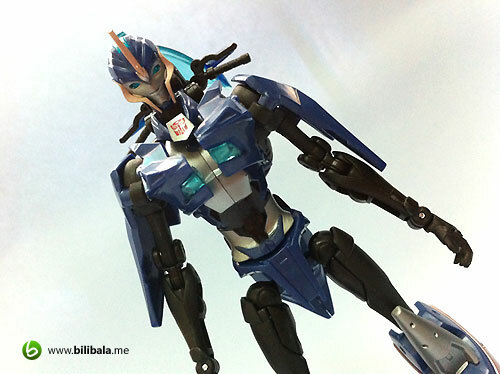 In the meantime, Arcee new face feature does remind me of those Japanese drawn manga character. What do you think? 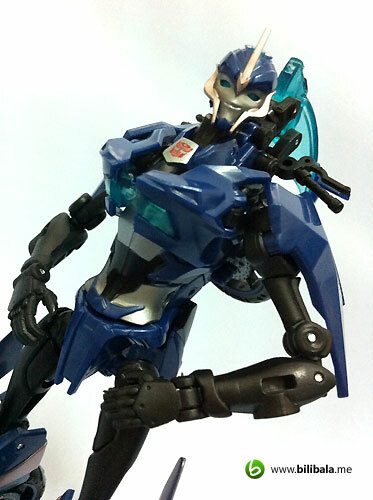 The Autobot insignia is imprinted nicely on the chest part which clearly shows who is she siding with. 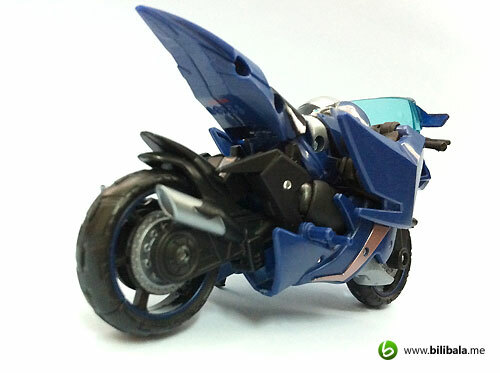 Transformation for her is quite intermediate and not as straightforward compared to Transformers Animated toys. This might need some of your time turning and tweaking around for the first transformation (especially the leg and head section transformation). But once you get a hang of it, it should be a breeze in transforming her. Well, get ready to feast your eyes with some random shots i have done for this beauty. Despite is not G1 colored, i really like the blue color combination of her (which closely resembles the color in Prime series). Dashboard for the bike. Don’t bother looking for extra more details like speed/mileage meter here. Much details to be seen on the tyre rim of the bike. Very neat. 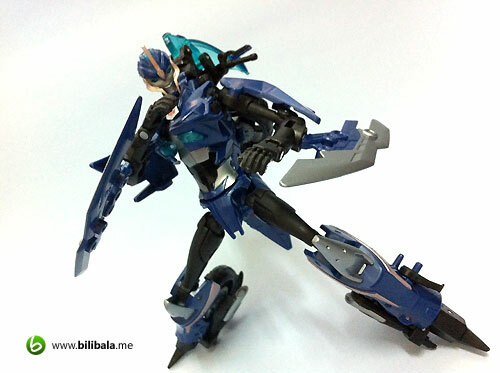 Few shots on the Arcee in robot mode. My most favorite shot. It brings out the feminine in her with her nicely designed eye piece. Well, definitely you won’t want to mess around with this beauty. 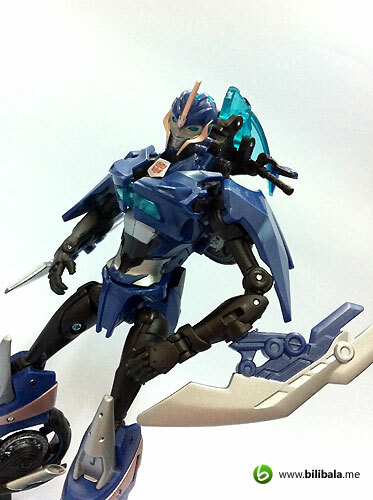 Transformers Prime: Arcee does exhibit tons of movie accurateness and you will see overall improvement of color painting, quality of material used and indulging transformation sequence. 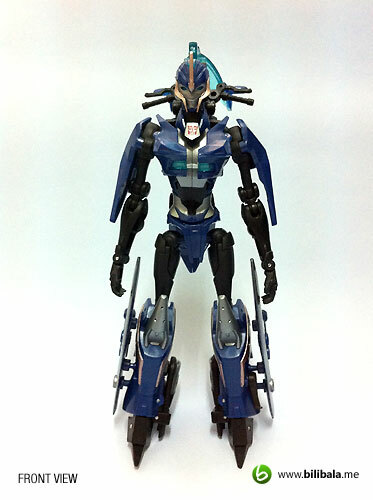 It does bring higher expectation to the coming figures for the same toyline. 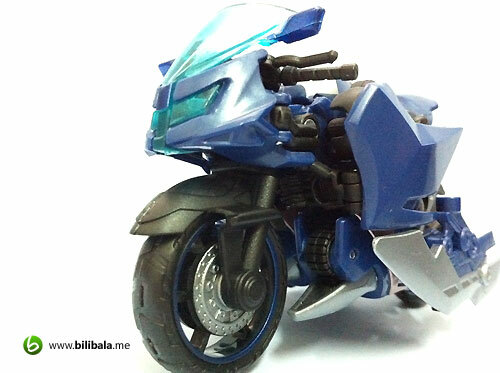 I am really happy and satisfy with the Transformer Prime toyline and you wouldn’t like to miss it out too if you are a Transformers Animated fans. 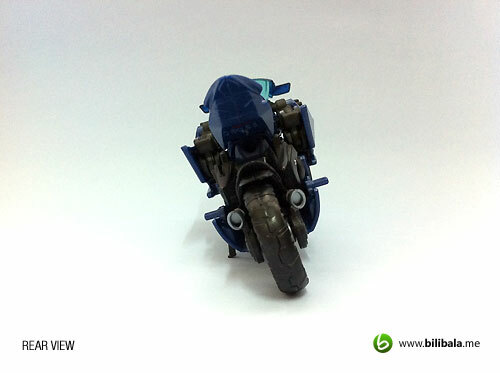 It does worth every single penny (despite the lack of gimmicks yet it is compensated with details packed figure) . Hi Francis, I just gotten myself RID version of Arcee, after going thru your review on the FE counterpart, i would say both RID and FE have pros and cons. 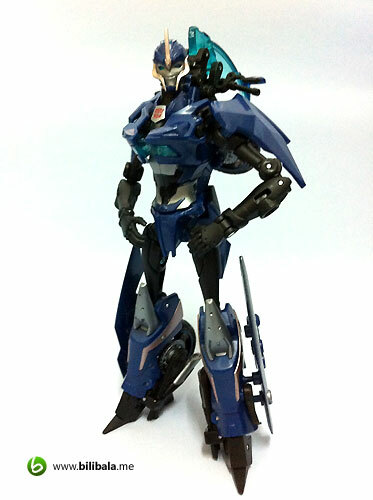 1) FE looks more 'macho' and less feminine compared to RID. 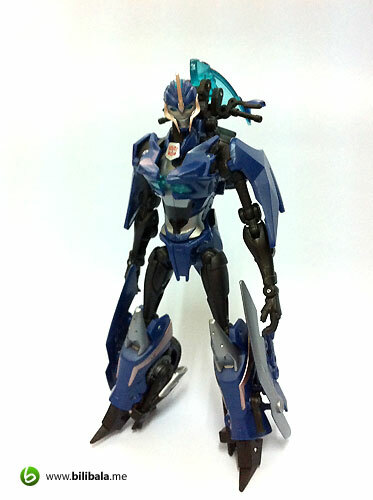 2) RID robot mode looks a bit clumsier, especially with the huge backpacks. Just my 2 cents. a friendlier face as compared to her big screen counterpart and lots more screentime to boot! 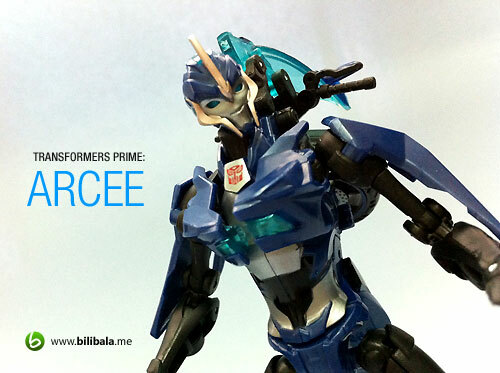 Best Arcee since G1! Great review man. Thumbs up ! Coming this toy line, there is something that we all should shout about. That is, detailed hand with fingers (though not articulated for deluxe class). 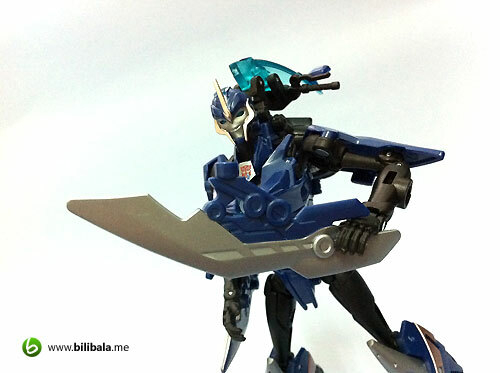 This is a big improvement over past toy lines where there is a hole in each hand for the purpose of holding weapon. That is ugly ! ugly ! I haven't got mine but feel very glad as you guys have gotta quality pieces that worth the penny ! The stand (paper made ?) is brilliant. Very nice pix especially the last one. Not bad, your blog getting interesting.